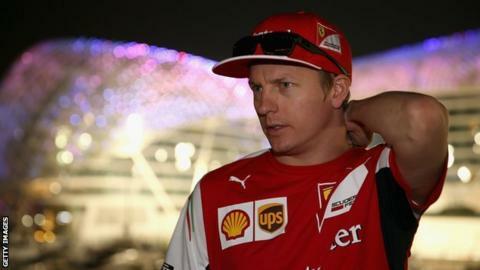 Kimi Raikkonen believes Ferrari have made significant improvements to the car over the winter. The 2007 world champion, who was 12th in the drivers' standings last year, finished second quickest behind Sauber's rookie Felipe Nasr on his first day of testing at Jerez. Raikkonen, 35, completed 92 laps driving the 2015 SF15-T Ferrari car. "You usually know if a car is good or not, and this year is a completely different story to last year," he said. Raikkonen was making his first appearance on the track on the third day of testing at the Spanish circuit, after his new team-mate, four-time world champion Sebastian Vettel, had tested the car on the opening two days. "The whole team has clearly done a very good job over the winter as it was a positive first day, with a lot of improvements in areas where we had difficulties," he continued. Ferrari appointed Maurizio Arrivabene as the new team principal and Vettel as the replacement for last season's number one driver Fernando Alonso over the close season, and Raikkonen says there is an air of optimism around the Maranello team. "The atmosphere is very good within the team," he said. "It's early days, but it's great to see how good it is, how well people are working together, and with Sebastian we have a good relationship so we can push the team forward. Raikkonen also confirmed that there is an option to extend his current contract with Ferrari, which is due to expire at the end of the season. "It's up to me and the team to do a good job this year," he said. "Obviously, the aim is to do well and there's a big chance. If everybody is happy then I am sure we can do well."